Breeding Season: Begins in October or November, 2 or 3 eggs laid, incubation 28 days, fledging age around 35 days. Estimated world population: - Birders can be a bit precious about the exact status of subspecies and which one lives where, so no-one is prepared to stick their neck out and make an estimate, I've seen thousands of them though and that was just in one smallish place, they are widespread and not considered to be threatened in any way. Feeding & diet: They feed in inshore waters often in groups of up to hundreds of birds referred to as a "raft", fish are the main prey followed by squid and then other opportunistic marine animals. Distribution: Circumpolar, a number of subspecies are found around the continent and on sub-Antarctic Islands, as far north as mid Chile and the Falkland Islands. Predators: Antarctic skuas and Dominican gulls can prey on eggs and unguarded young chicks. What are Blue Eyed Shags like? 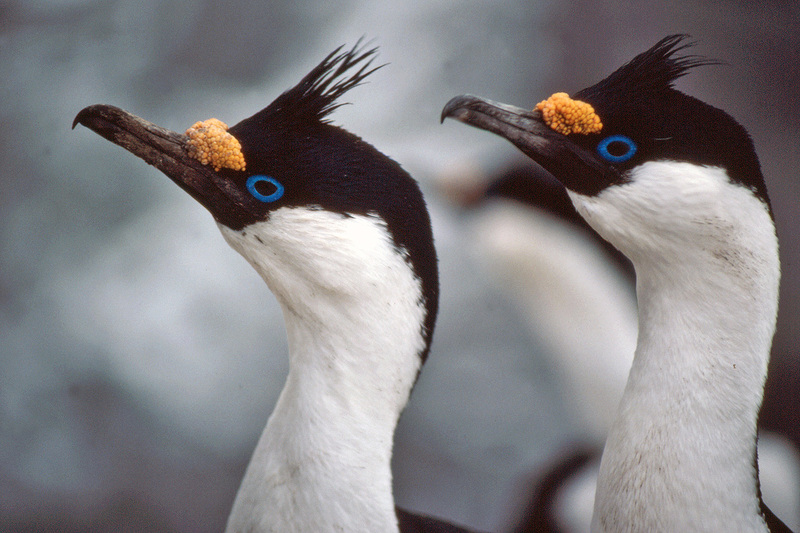 Blue eyed shags are the only member of the cormorants to venture down into the Antarctic proper. They are found particularly along the Scotia arc islands and down the Antarctic peninsula, venturing as far as 68 degrees south. They are characterized by the vivid eye colour and the orange / yellow growth at the base of the beak that becomes particularly large and bright during the breeding season. They feed mainly on fish frequently forming a "raft" made up of dozens or hundreds of birds that repeatedly dive down onto the shoals below helping each other by panicking the fish into having nowhere to go except into the beak of the next bird. They are excellent divers with a recorded maximum dive of 116m. Once underwater they tuck their wings in and use their powerful webbed feet to propel themselves. It's not actually the eye that is blue, but the region of skin surrounding the eye. Feeding behaviour, a raft of shags, fishing en-masse like this confuses fish which may evade one bird and swim into another. 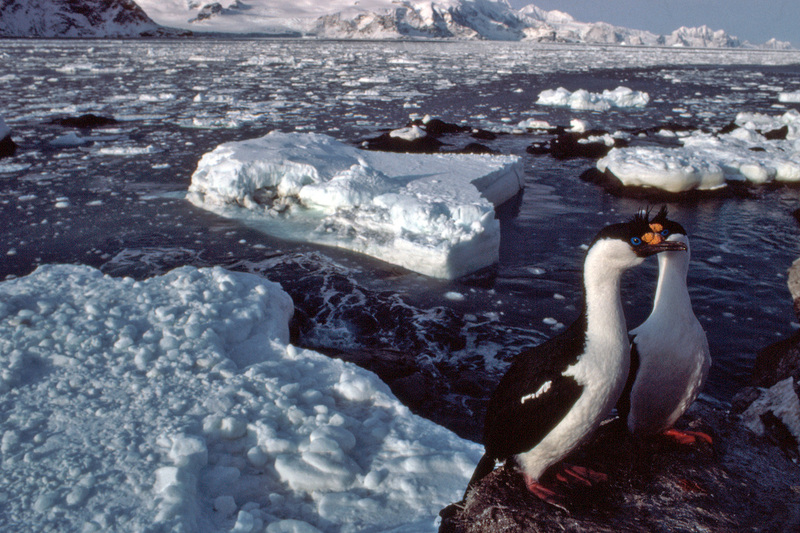 These pairs have arrived on their nesting site on a sub-Antarctic island as the last of the winter ice is breaking out. 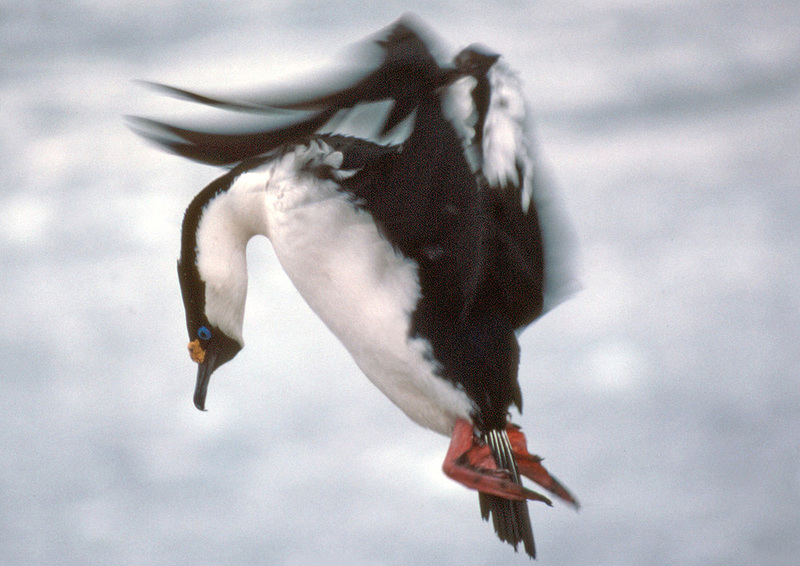 Blue eyed shags are not birds of the ice, usually staying out of the way of sea-ice. 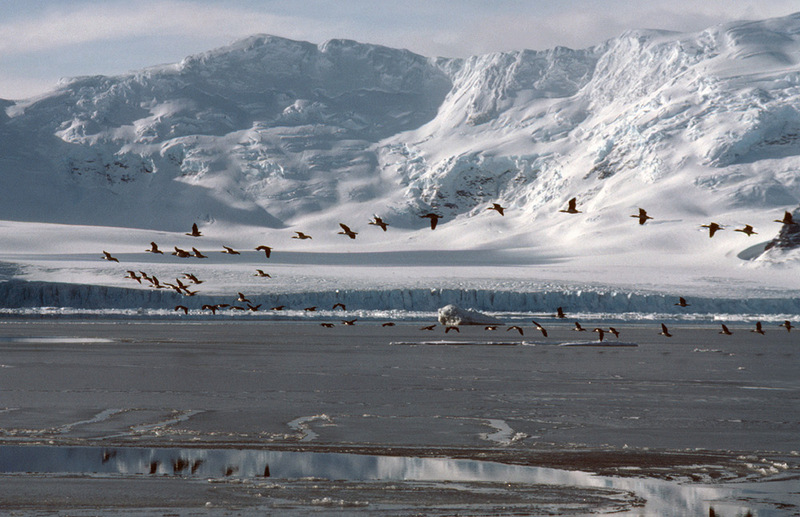 They are unique in Antarctic and sub-Antarctic birds in that they will maintain a nest year-round where the sea remains ice-free. They never venture far from their nest site out to sea and because of this were welcomed by the early explorers and sealers who were looking for isolated areas of land in the vast sea-scape of the southern ocean. To see these birds in any numbers meant that land was close by. Unlike the small piles of stones that tend to suffice as a nest for other Antarctic birds, those of shags are veritable castles by comparison. They are made of plant matter which usually means sea-weed as there aren't really any land plants from which to make nests. This is stuck together with mud, the results are tall nests with a substantial dip in the top where the chicks can be protected from the elements by the parents. Such nests can last for a number of years, being built up higher as they are maintained and repaired by the parents each spring. 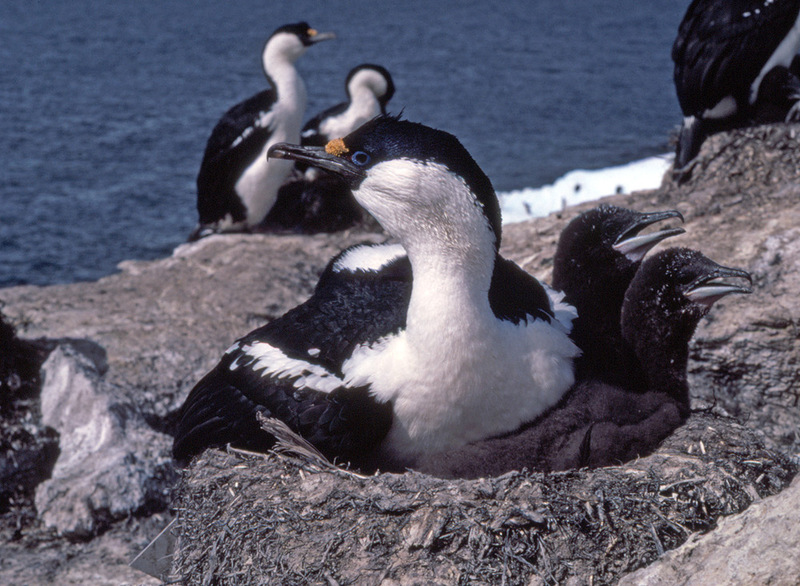 Shag chicks are unique amongst Antarctic birds in that they have the only chicks that are born naked with no down. This makes them particularly susceptible to bad weather and especially dependent on their parents when very young. 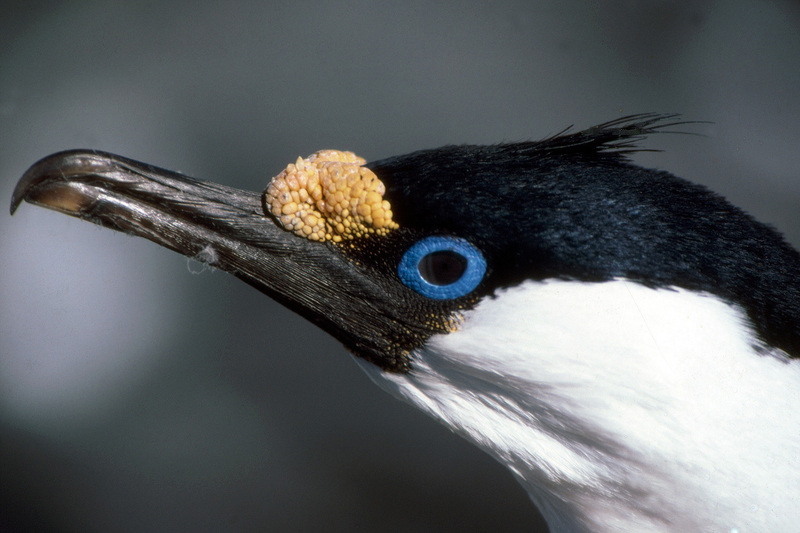 Blue eyed shags nest in colonies of their own species. 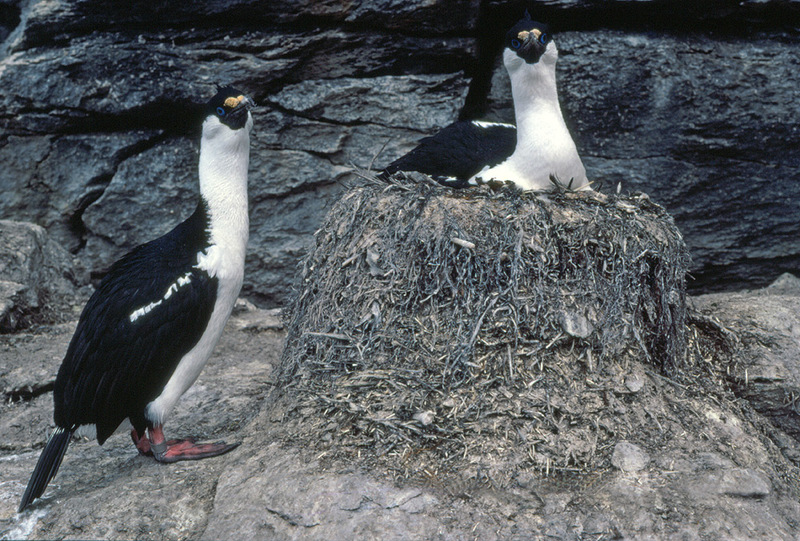 There are a number of "Shag Rocks" around the world, for instance, one set of isolated rocks is situated sticking out of the South Atlantic about 250 kilometres from the next nearest island of South Georgia. These are home to countless blue eyed shags and virtually nothing else. Likewise the aptly named Shagnasty Island just off Signy Island in the South Orkneys is home to a large monoculture of these birds, and a very loud and smelly place it is too! there are lots of shags there and it's quite a nasty place to visit. When I worked at the scientific station on Signy, one of our number used to visit there on a regular basis, he had a set of outer clothes for the purpose that were kept outside of the base buildings, he put them on when leaving and took them off when he arrived back, you could still smell when he'd been recently though. Like many types of penguins these shags are adept and compulsive thieves stealing the unguarded nest material from any neighbouring nests if at all possible. A habit that contributes to a raucous and very lively colony. Colonies tend to be quite densely occupied by birds, so coming into land requires particular attention. 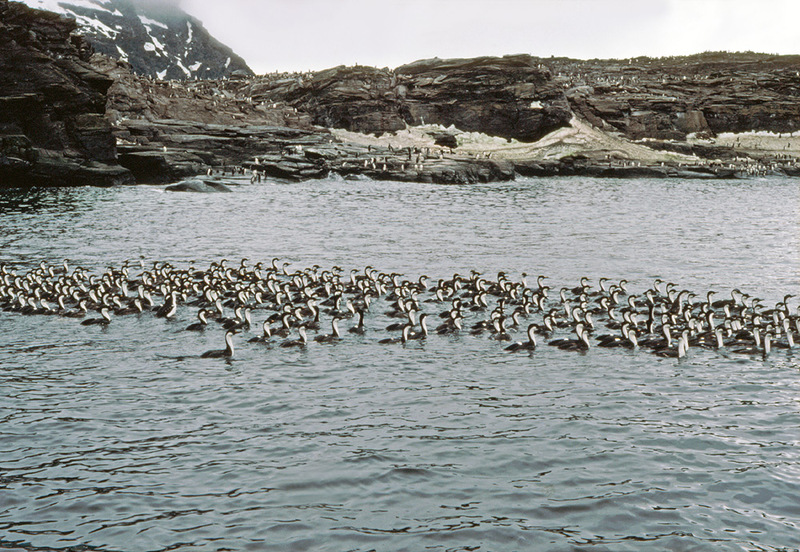 A flock of shags flying back to their colony from the fishing grounds, shags frequently travel and feed in large groups.